One of the larger, more challenging pieces I've ever written is finally finished. 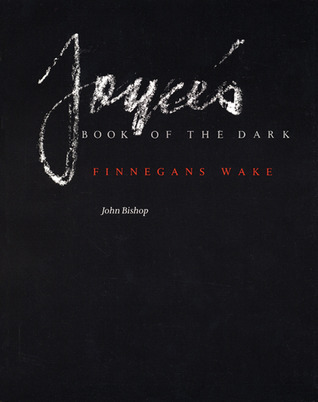 For almost two years now I've been studying John Bishop's classic work of Finnegans Wake analysis, Joyce's Book of the Dark, and spent the last year writing a walkthrough/summary of its important ideas. The final part of that 4-part review is now posted at my other blog. I encourage you to go give it a read. This final part is all about the female archetype in the Wake, the river goddess Anna Livia Plurabelle, and what she comes to represent in Bishop's interpretation. His entire book is built around the premise that the Wake is the account of what goes on inside the body of one man as he sleeps. Having constructed a towering argument on the basis of his thesis, Bishop concludes with an in-depth analysis of the 8th chapter of the Wake, the Anna Livia Plurabelle chapter. He finds that the sounds of "the hitherandthithering waters of" night (FW p. 216) described throughout the chapter are actually the consistent systole and diastole thumps of the sleeper's pulse. As he falls into deep sleep his vigilant ears focus on the sounds of his heartbeat leading him to reminisce, regress back to the prenatal bliss of "foetal sleep" (FW p. 563) inside the womb. It's a groundbreaking argument, unlike anything I've read about the Wake, and Bishop presents his ideas so thoroughly and with such scientific rigor that it transforms not only the way one looks at Joyce's book but the phenomenon of sleep in general. That is why I had to write about it. To be honest, I have wanted to write about Bishop's book since I first discovered it, years before I actually read it. One of the reasons I decided to start writing a blog in the first place was so I could eventually share an in-depth look at Bishop's text. (In fact, the title and subtitle for my other blog come from Bishop's text.) I discovered it back in 2009 or 2010, thumbed through it in amazement and was shocked and disappointed to find that the internet contains virtually zero discussion of this great book. I hope you'll find the time to go have a look. Here are the links to the full four-part series. Discussing the basics of Bishop's theory and the psycho-archeological approach Joyce adapted from Vico. On the Wake's science of sight and sound for the sleeping. How to read Finnegans Wake. An examination of Bishop's "Riverbabble Primer". Congratulations, PQ. I have recently been thinking it's really time for me to engage with that book, and I guess I'll use your posts as a guide to the guide to the Wake. It will probably have to wait till after the middle of November, though. Meanwhile, I'll put a note up on our blog today to help spread the word. The book is BIG and occasionally makes for dense reading, but it's also enjoyable. Definitely the most entertaining work of scholarship I've ever read.